Tony: 11 – It’s not Eriq’s fault who he’s related to! Despite that – he has turned into a very useful MLS defender capable of eating minutes as a starter or offering fresh legs from the bench. Not spectacular in any way, but rarely hurts you either. 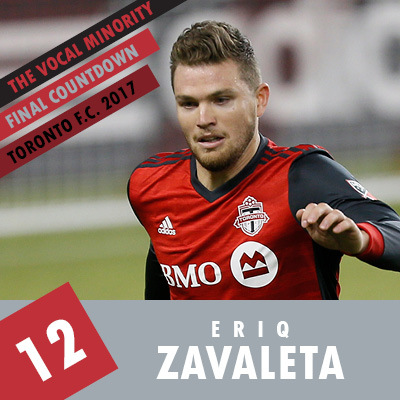 We crack wise on the VMP about the awkward family dinners after Greg Vanney has benched his nephew Eriq Zavaleta, but truth be told – he’s good enough to pass the potatoes on most days on TFC’s back line. In a case of exceeding expectations, Zavaleta had a very solid 2017. Is he ready to be hailed as a lock in the centreback role? Not likely – he didn’t even quite make it to the MLS playoffs. But hey – 2356 minutes patrolling the defence on one of MLS’ stingiest teams without too many major gaffes is yeoman’s work. Aided by some injury holes, Zavaleta made the most of his time and ended up being a go-to starter for long stretches of the regular season. He’s not spectacular but he’s exactly the kind of depth – and young depth is great – that makes up a championship side. If rumours are to be believed then TFC are on the off-season lookout for a new starting central defender. However, if they fail in that quest and Drew Moor continues to lose steps as age catches up – then Zavaleta will once again be called on to hold down The Reds’ D. And that’s no longer something that makes supporters panic. Mark: 7 – Was the most consistent player all season. Rarely disappeared and rarely disappointed from game to game. Duncan: 9 – Very good season from the nifty nephew, fully justifying his spot in the middle 3. Except for that one game against Montreal where a bunch of things went wrong and ended up in goals conceded. Jeff: 4 – Probably controversial at #4. He is the most underrated player in MLS. A rock, never gets beaten one-on-one, good on the ball – so calm and composed for his age. A big part of the TFC wall of defence. JordyLike: 17 – More than adequate backup when needed to fill in for any of the 3 CBs ahead of him. Clearly not Vanney’s favourite nephew, but I imagine everyone else will make a nepotism joke anyway. TuffyRocks: 13 – Solid D man. MarkHSV: 12 – I might be ranking Zavaleta too low, but he doesn’t do a lot of exciting stuff on the pitch. Looks much more comfortable than last year though, and is not out of place in the 3-man back line. Mel: 17 – I felt there was an improvement in his game this year. He seems more comfortable on the backline. James: 9 – Zavaleta fits into that familiar category of so endlessly solid in doing his job that the rare missteps seem to garner more attention than the 99% of the time that he is one of the best defenders on this team. His one-on-one defending allowed TFC to be the forward-looking team that they are, especially in the three-man centre-back formation, where with full-backs forward, those outside would be relied upon to shutdown quick counters. Aron: 12 – What do you think Thanksgiving dinner was like after his uncle subbed him off after he stunk up the game for 35 minutes then had a hissy fit. ZicoZay: 18 – A good option to plug into the defense. YellingAtSoccer: 12 – I’m at a blank for this one, it just feels right. Alex: 10 – Solid defensively , was key to the back three working so well, will begin to gradually take over from Moor. Jen: 15 – All these back line guys are pretty good so I’ll just lump them in together. TweetKred: 11 – But for getting torched by Piatti in that one game Zavs was a solid piece of the backline. His ability to stand up and take the ball off of good strikers was very fun to watch. A great player who has more upside potential. Some great arguments here endorsing Zav. I seem to have tuned out Zavaleta’s early season performance.